Which is the right way to promote a business?Recently Lara wrote a post giving some advice around whether business owners should promote their business through their personal profiles. Ultimately, we feel that decision is one that can be very different from one person to the next - just as how we all use social networks and what we share is different. 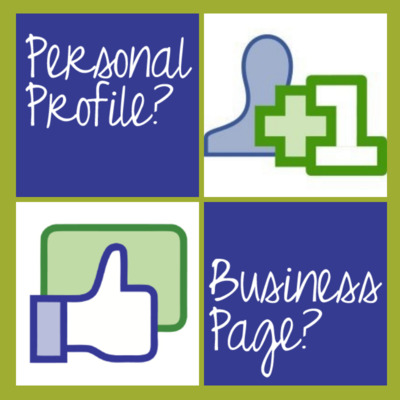 Some business owners like to keep their profiles personal and private. Others supplement their networking efforts by extending it to their personal profile. There isn’t really a right or wrong answer if you’re comfortable with your choice. Someone who shared our post made the comment that they don’t ever recommend it. I was curious as to why, so I asked. Their response was that the personal profile doesn’t have insights, ads or third-party apps. Very sensible reasons if the post was about using a personal profile exclusively to promote a business on Facebook. Just as there was some confusion about what Lara was writing about, there is some confusion around what is best for businesses. Personal profiles (or personal accounts) are designed for individuals and require reciprocity. If I send you a friend request and you accept, we see content from each other (assuming we aren’t using any privacy filters). If you decline my friend request, I see nothing of yours and you see nothing of mine (unless it’s public). The idea is that if we are “friends”, we know each other well enough to connect and share our lives with each other through Facebook. There is an exception to Facebook’s rule of reciprocity: following. This feature was introduced about two years ago and was originally called subscribe. It allows non-friends to follow public updates for any individual that has the feature activated. If you follow me, you can see anything I post publicly in your timeline, but I can’t see anything of yours. Some higher profile individuals actually deleted or stopped using their Facebook Pages after this feature was released. Back in 2007, Facebook opened up to the world at large. Personal profiles were the only thing available, but businesses were already starting to see the value of all these people that were held captive by pokes and wall posts. The answer to this problem was Pages. They were a way for businesses to acquire an unlimited fan base and gave the fans access to the page without allowing the page to see personal details of its fans. It was a win-win situation for everybody. Page Insights show the data behind the performance of every post you publish so you know what time is best to post and what types of posts are getting more engagement from your audience. Pages allow the option of running ads to extend your reach. Finally, Pages allow admins to install third-party apps for newsletter signups, contests and numerous other purposes. Since Facebook has implemented EdgeRank and limits what we see, I’ve seen many page admins talk about switching to a profile or a group so people definitely see their content. However, notifications are easily turned off in groups and I won’t friend an entity that uses a Personal Profile. And EdgeRank affects Personal Profiles in the same way that it affects content from Pages. Ultimately, it comes down to this: if you have a business that you want to promote on Facebook, you should set up a business Page for it because that’s how Facebook says it needs to be. And also because you can control and see so much more than you can with just a profile. You can still share content from you business Page to your personal profile (if you’re comfortable doing so) too! Do you know any businesses that are using a personal profile? How do you feel about that?